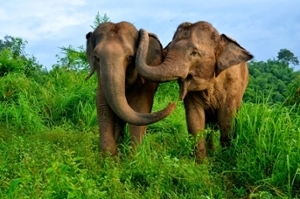 Asian elephants console others who are in distress, usingphysical touches and vocalizations, finds a study to be published in the journal PeerJ. Consolation behavior is rare in the animal kingdom, with empirical evidence previously provided only for the great apes, canines and certain corvids. Plotnik received his PhD from Emory in 2010 and is currently a lecturer in conservation biology at Mahidol University in Thailand and CEO of Think Elephants International, a non-profit focused on education and conservation. His main research interest is convergent cognitive evolution: The independent evolution of similar features of intelligence in species of different lineages. While Plotnik was still at Emory, he and de Waal provided evidence that elephants can both recognize themselves in a mirror – a test of self-awareness passed only by some apes, dolphins and magpies – and problem-solve cooperatively. “Humans are unique in many ways, but not in as many ways as we once thought,” Plotnik says. The current study focused on a group of 26 captive Asian elephants spread over about 30 acres at an elephant camp in northern Thailand. For nearly a year, the researchers observed and recorded incidences when an elephant displayed a stress reaction, and the responses from other nearby elephants. The initial stress responses came from either unobservable, or obvious, stimuli: Events such as a dog walking past, a snake or other potentially dangerous animal rustling the grass, or the presence of another, unfriendly elephant. “When an elephant gets spooked, its ears go out, its tail stands erect or curls out, and it may emit a low-frequency rumble, trumpet and roar to signal its distress,” Plotnik says. Wild populations of elephants, however, are becoming increasingly scarce: Both Asian elephants and African elephants are endangered. In addition to conducting research, Plotnik strives to educate children in Thailand and the United States about the importance of conserving elephants and their shrinking habitats.